When You Are Grounded, Everything Changes. 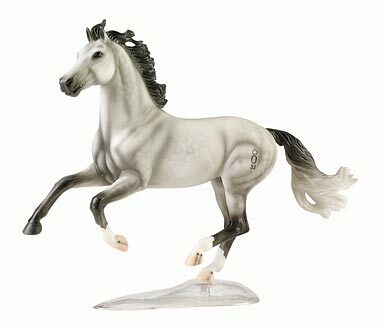 Oldenburg Stallion - Breyer model. Ric, a 6 year old Oldenburg gelding, was very inconsistent in his work. Some days he was “there” and other days he was spooky and disconnected. At 17.2 hands, this made him scary to work with and to ride. His person, Sue, tried Reiki, essential oils, myofascial release, and Tibetan Bowl therapies to no avail. 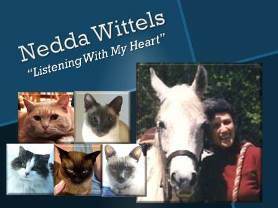 In an Animal Communication session, Nedda encouraged Ric to speak about how he was feeling. He told her he is very sensitive and doesn’t know how to filter out other people’s thoughts and emotions. He also said he didn’t feel safe in his body. He said he really wants to connect with his person, Sue, but doesn’t really trust anyone. He released a great deal of grief during the conversation. It was clear to Nedda that Ric was not very grounded. In fact, he seemed to be as much out of his body as in it. In a Multidimensional Healing which Ric cautiously and somewhat suspiciously agreed to have, Nedda and her “upstairs” team of healers opened energy jams in Ric’s knees and hocks that were preventing him from being fully in his body. The chakras in his knees and hocks were cleansed of past life issues that were stuck there and were repaired to full functioning. Nedda then showed Ric how to breath fully into all 4 of his legs and to feel connected, grounded, and supported by Mother Earth. She followed this with a brain balancing technique that would help him feel mentally connected and able to make choices about what to let in and what to keep out so Ric could create and maintain his own mental/emotional boundaries. Then Nedda filled him with energy, balancing his whole body. When I turned him in the indoor his body is again soft and fluid. He looked spectacular playing! Here is the best part – He has never behaved like this before – After freely moving he came up to me five separate times and stood squarely in front of me. Each “visit” with me showed a progressively increasing, very strong, and powerful energy was radiating from him into my torso. Each time he came to me the vibration was more intense. At first it was a very intimidating force that really caught me by surprise — OK – it shocked me. Then it became apparent that he was wanted me to feel what his body felt like and he was so grateful. I can still feel him hours later. Pretty cool huh? His eyes stayed soft the entire time I was with him. Pretty amazing! I’ll have to ponder on this, it really has far-reaching implications for animals & humans alike. To be in the force of one’s true energy must be marvelous! Being ungrounded is very common among humans, especially in Western culture. We tend to be in our heads a lot because we are encouraged/taught/programmed to be there. When you are fully in your body, including your toes and your auric field, which, by the way, extends down below your feet for 6-8 inches, you feel safer, more connected, more at home, more comfortable, and more YOU. It’s a good feeling. MARVELOUS!!!!!! How wonderful that he ‘showed’ her how he felt afterward too!!! The more we “listen” to animals and truly communicate with them by letting them know that they, too, are “heard”, the more responsive they become. There is a semi-feral cat I call Hattie whom I feed daily and who hangs out in my back yard at times. She become very friendly when she participated in an online Animal Communication practice group as one of the faculty. It was amazing how she changed during the time when lots of people where talking to her. She began rubbing up against me and wanting me to scratch her head. Now, this was a big change because she had been in my yard for many years. When the group ended, she became more distant again. She really missed the interaction with the practice group members.